Isole e Olena has changed a great deal since I first drove up a dirt road looking for the place in the early 1990s. Winemaker Paolo De Marchi was mobbed at Vinitaly, so I made a late morning appointment to discuss some of the changes, and how the estate and his thoughts have developed since the last time I wrote something down. Unfortunately, his early morning appointment went way past morning, so the discussion will have to wait -- after I finished tasting the wines, which took me almost as long as it took him to wrap up his first appointment, his wife Marta and I talked about the pitfalls of raising adolescent boys, and then we simply ate lunch and chatted. I started with Paolo's Chardonnay, which featured a surprise this time: To combat problems of corkage, he's experimenting with screw caps, and I got to compare bottles with the two kinds of closure. This is not an experiment, but is the first vintage that Paolo has applied a screw cap to. It's the same lot as the regular cork-stoppered Chardonnay because they were bottled on the same day. Brassy gold with brilliant golden reflections and white rim. The bouquet is bright and fresh, with deft tropical fruit -- passion fruit and some pineapple supported by barest hints of butterscotch and bright slightly greenish acidity. Quite pleasant and very much alive, in a wide-eyed, welcoming sort of way. On the palate it's full and rich, with clean, elegant white fruit supported by clean bright lemony mineral acidity and by rather languorous hints of butterscotch structure that flow into a long, deft slightly bitter finish. Great control and extremely pleasant to drink; it is the sort of thing that will work well with elegant creamy dishes -- a seductive risotto with shrimp comes to mind, as does the spring standby, asparagus risotto -- and is also the sort of wine you may simply decided to enjoy with a special somebody, far from the table. Impressive. Brilliant brassy gold with a very slight greenish cast to the golden reflections that I see and don't see, and white rim. The bouquet is bright, with tropical fruit, a mix of passion fruit and pineapple laced with hints of heather and butterscotch; it does differ slightly from the screw cap, with slight vegetal accents, while the screw cap seems a little crisper. On the palate it's full and rich, with elegant lemony passion fruit with clean bright citric acidity that is less mineral than the screw cap's, and supported by a pleasant languidity from butterscotch and glycerin. It's a bit softer and more seductive than the screw cap wine, and not quite as crisp; in terms of serving suggestions I would go with slightly less creamy dishes, say an elegant fish sauced pasta, or with grilled fish that's flavorful but not too sharp. Sea bass comes to mind. And again, it will be nice far from the table. Comparing them side-by-side is like looking at a pair of twins, who might seem identical at first glance, but reveal differences as one gets to know them; the screw cap wine is just a touch crisper and has a slightly harder edge to it, whereas the cork-stoppered wine is a little softer, and comes across as slightly more seductive. Both are very fine, and which you prefer will be a matter of taste. To continue with the twins analogy, one trains competitively -- the screw cap -- while the other -- the cork stopper -- dances. Delicate black cherry ruby with black reflections. The bouquet is fairly rich, with brambly cherry fruit supported by slightly greenish acidity and by warm slightly balsamic accents and slight animal tang; as it opens hints of menthol also emerge. Nice balance, and pleasant to sniff, in a slightly underripe key -- it was a wet cold summer and the aromas reflect this. On the palate it's medium bodied and rich, with clean slightly brambly cherry fruit supported by bright acidity that has a greenish cast, and by tannins that have a clean deft burr and flow into a clean sour cherry finish with tannins underpinning. Very pleasant, and a fine food wine; it will work very well with succulent grilled meats, and also with light stews -- beef or pork, while there is also sufficient acidity for it to work well with a platter of mixed fried meats and vegetables. Elegnat cherry ruby with black reflections and white rim. The bouquet is muted -- youth at work, though swishing brings up cherry fruit supported by dusky overtones and some vegetal accents. It opens nicely, but needs another year to get its bearings and develop. On the palate it's medium bodied and rich, with elegant cherry and forest berry fruit supported by smooth sweet tannins -- smoother than those of the 05 -- and by bright slightly citric acidity that flows into a clean fresh slightly sour cherry finish. Very pleasant, and will be very nice with grilled meats or light stews, though it does need another year to come together and develop. Expect it to age well for 5-8 years. Worth seeking out. This is the blend, which will soon go into bottle. It's lively cherry ruby with youthful hints of violets, and has an elegant bouquet that's quite impressive for an unbottled wine, with an abundance of violets and jammy forest berry fruit, in particular blackberries and some black cherries. Youth, snd very nice to sniff. On the palate it's medium bodied with rich cherry and forest berry fruit supported by slight jammy accents and by smooth sweet tannins that flow into a clean jammy fruit finish; by comparison with the two older wines it's less acidic and consequently comes across as smoother, though there are pleasant bitter accents to provide a counterpoint to the fruit; because of its having less acidity it will be better suited to somewhat drier meats -- in other words, not sausages, nor spare ribs, but rather chops (lamb or pork) or roasts, for example lean roast beef cooked rare. Deep black cherry ruby with black reflections and cherry rim. The bouquet is rich and powerful, with elegant sour cherry fruit laced with slightly savory acidity and supported by hints of cedar -- there is wood, but it supports discreetly -- and slight greenish accents. Beautiful and very young. On the palate it's full and rich, with powerful cherry fruit supported by deft berry fruit acidity and by smooth sweet tannins that flow into a clean bright cherry finish with some sour savory underpinning. It's well muscled, but very light on its toes, rather like a gymnast, and is quite capable of making what would seem very difficult for others seam easy. Beautiful, and it will lend magic to a meal built around a porterhouse steak, though I would be tempted to set it aside, because it will improve markedly over the next 5-10 and perhaps even 15 years. Deep black cherry ruby with black reflections and cherry rim. The bouquet is fairly intense, with moderate cherry fruit supported by fairly intense cedar and some savory accents; there isn't much acidity, and wood is carrying the show. The palate reflects the nose; the wine is fairly rich, with pleasant moderately intense cherry fruit supported by smooth cedar-laced tannins and moderate berry fruit acidity that flow into a clean fairly fresh cedar-laced finish. It's clearly from a weaker vintage, and relies much more on wood than wines from better vintages do. Wood that does a nice job, but for the wine to really work for you, you have to like wines that are oaked -- oaked well, but oaked. Deep black cherry ruby with black reflections and cherry rim. The bouquet is elegant, in a rather haunting key, with clean rich berry fruit laced with sea salt and spice, and also some deft mineral acidity, and slight underbrush. Very pleasant, though still a babe; it's obviously at the beginning of a long journey. On the palate it's full and rich, with powerful cherry fruit supported by deft shadowy berry fruit acidity and by sweet tannins that have a slight youthful burr and flow into a clean sour berry fruit finish with a greenish tannic underpinning. Very pleasant, though it needs time; one could drink it now with a steak or leg of lamb, but to do so would be an infanticide. It will begin to be drinkable in 2-3 years, and age nicely at least through 2020. Deep black cherry ruby with black reflections and cherry rim. The bouquet is rich, with jammy berry fruit laced with underbrush and deft mentholated spice. Quite elegant, and still very fresh, with a lot going on. On the palate it's medium bodied and quite rich, with deft, rather languid forest berry fruit, a mixture of blackberry and currant with underlying cherries, supported by moderate tobacco leaf acidity and by smooth sweet tannins that flow into a clean rich berry fruit finish. Quite elegant, and will drink very well with succulent red meats that aren't too fatty; roast beef cooked rare for example, or leg of lamb. It will also age nicely for at least another 5-10 years. An unlabeled sample from the bin where the bottled wines are aging. Deep violet ruby with black reflections and cherry rim. The bouquet is bright and rich, with considerable underbrush supported by spice, bell pepper, and underlying berry fruit; it's more varietal than the 2004 and though this is perhaps pertly youth, it's also a vintage variation. On the palate it's medium bodied, with rich mineral berry fruit laced with leaf tobacco and supported by deft, almost lacy acidity, and by smooth sweet tannins that flow into a clean bright berry fruit finish with an underpinning of underbrush. Quite pleasant, and will drink very well with red meats now, though I might be tempted to give it a few years, because it will also do interesting things with time. In short, a wine to buy several bottles of, and to follow. This is primarily Cabernet Sauvignon, though there is just a little Cabernet Franc. It's deep black cherry ruby with black reflections and cherry rim, and has an elegant bouquet with rich, fairly tart berry fruit supported by clean vegetal accents, and deft bright acidity. I certainly wouldn't have guessed its age without seeing the label. On the palate it's rich and full, with powerful bright cherry fruit supported by bright slightly vegetal cherry acidity, and by smooth sweet tannins that flow into a farly long slightly tart cherry finish. Very pleasant, and will bring magic to a meal featuring hearty red meats, from steak through stewed wild boar. Most impressive, and will age nicely for at least another decade, or perhaps more. Paolo is just starting to sell this vintage -- after several years of bottle age. It's deep black cherry ruby with black reflections and cherry rim. The bouquet is deft, with fairly rich jammy berry fruit supported by some greenish spice, slight vegetal accents, and by hints of prunes. Clearly from a hot vintage, though not cooked. On the palate it's full and rich, with fairly sweet dusky cherry and forest berry fruit supported by moderate acidity -- enough to provide direction, but not much more -- and by clean sweet tannins that have some dusky cedar accents, and flow into a clean fairly rich berry fruit finish with peppery spice that does have some bell pepper accents. It's pleasant, in a rather voluptuous fruit driven key that is dictated more by the vintage than by stylistic concerns of the winery; it's also a wine that will drink nicely with flavorful, not too fatty roasts or stews. It's further along than the 2001, but this is because of the vintage. Tawny amber with brilliant dried apricot reflections. The bouquet is mind-bendingly rich, with sweet dried apricots mingled with brown sugar and hints of oatmeal, and rich green walnut skin, and warmth, and a fair amount of alcohol, and polished wood, and… new things keep emerging. On the palate it's rich and full, with powerful dried apricot fruit supported by deft apricot acidity and walnut bitterness that gradually give way to apricot laced sugary warmth, while the walnut skins carry on, slowly emerging with time. A beautiful vinsanto, of the kind that one can sip today and remember (vividly) next year, and if one is blessed with a memory for wines, for much, much longer. Proprietà Sperino is an estate in Northern Piemonte that has been in the De Marchi family for a while, and Paolo has long dreamed of making wines there. Now he is, with his son Luca, who also signs the labels, overseeing things Day to Day. This is a blend of Nebbiolo, Vespolina and Croatina -- the traditional blend of the region -- and is pale almandine ruby with black reflections and white rim. The bouquet is fresh and tart, with lively sour cherry fruit supported by bright slightly greenish acidity and by barest hints of sandalwood; it's quite pleasant and very welcoming in a wide-eyed sort of way. On the palate it's rich, with bright sour cherry ft supported by lively berry fruit acidity -- a mix of red currant and sour cherry -- and by smooth sweet tannins that flow into a clean slightly greenish sour cherry finish. Very pleasant, a bright eyed, bushy tailed wine that will work very well at a cookout or with meats off the grill, and is something I would drink sooner than later, because though ti will age nicely for a few years, its freshness is captivating. Expect it to go quickly, and you may want a second bottle. This wine has both Paolo and his son Luca's signatures on the label; it's a Nebbiolo and is elegant almandine ruby with black reflections and some almandine in the rim. The bouquet is delicate, and still somewhat closed, though swishing brings up cherry and red berry fruit supported by some rosa canina and hints of underbrush, with delicate spice and acidity as well. It's clearly still getting its bearings, but promises quite nicely. On the palate it's full and rich, with brash sour cherry fruit supported by bright berry fruit acidity and by tannins that have a lively greenish burr and flow into a fairly long tart finish. A classic Nebbiolo of the Alto Piemonte, replete with lively aggressiveness, and will drink very well with succulent red meats, either from the oven or the stew pot, and if you prepare a rich platter of mixed grilled meats that's long on things such as ribs (well seasoned) you will find it works well with them too. Impressive, and even those who prefer the smoothness of the more international style will find things to think about; if you're a traditionalist you will enjoy it very much. This doesn't have a vintage because it's a table wine and they can't have vintages, but it's a 2004. As the name implies, it's a Cabernet Franc. Deep black cherry ruby with black reflections and cherry rim. The nose is, well, varietal: a tremendous rush of grilled pepper with underlying vegetal accents, and quite pleasant, though still young, and less complex than it likely will be. On the palate it's rich, with lively bell pepper laced berry fruit supported by moderate acidity and by smooth sweet tannins that flow into a clean fresh rather bitter pepper-laced finish. It's a classic Cabernet Franc, and brashly satisfied at being what it is; if you like the varietal you will enjoy the wine. Considerably. If you're less of a Cabernet fan you may like it less, though chances are that you'll still find things to think about and appreciate in it. It will work quite well with grilled meats, hearty roasts, and also stews, including more exotic things such as goulash. Want to know more about Isole e Olena? Check Paolo's site. And, if you want to find the wines, check Wineaccess or Snooth. Pale brassy yellow with white rim. The bouquet is fresh, with floral accents and heather, mingled with tart white fruit, more pineapple than grapeft. On the palate it's fairly rich, with bitter minerality laced with heather that flows into a clean bitter finish. Quite direct, and will drink well with cheese or egg based dishes -- say an oniony quiche or frittata -- or with simple grilled fish or white meats. Expect it to go quickly. Pale greenish white with brassy reflections. The bouquet is fairly rich, with heather and some greenish vegetal accents mingled with underripe honeydew melon. Nice balance and inviting in a youthful key. On the palate it's fairly full, with lively minerality and heather supported by tart almost peppery acidity that flows into a clean rather bitter finish. Pleasant and will drink well as an aperitif, or with creamy fish dishes -- a fish risotto, for example. This was a vineyard selection, but is now a selection of the best grapes from their Soave vineyards. It's brassy yellow with brassy reflections, and white rim; the bouquet is bright and rich with heather supported by deft greenish acidity and spice from grapes; it displays nice balance and has a fair amount to say. On the palate it's full and rich, with heather and vegetal acidity with underlying minerality that flows into a clean mineral finish with underlying bitterness. Welcoming; it will be nice as an aperitif or with rich first courses, creamy pesto sauces come do mind, as do fish-based pasta dishes and risotti. It will also be apleasant aperitif. This wine is still made with some Molinara -- about 10% -- and is from their only flat-lying vineyard. It's also what Sabrina Tedeschi likes to drink day to day: Lively ruby with cherry reflections and has a fresh, bright berry fruit bouquet laced with hints of sandalwood and some vegetal accents. Quite refreshing, and inviting, rather like a pretty teen with a challenging stare. On the palate it's fresh, and bright, with lively red berry fruit supported by brisk acidity and tannins that are warm, with a clean burr, and flow into a clean berry fruit finish. An absolutely classic food wine that will drink well with all sorts of things, from quickly grilled meats through red-sauced pastas and fried meats and vegetables. It will also be nice at a cookout, and will go fast. This is their basic Valpolicella Superiore, and is a lively cherry ruby with black reflections and hints of almandine at the rim. The bouquet is fresh, with pleasant sandalwood laced with red berry fruit, spice, and some cedar; there's nice depth and it's quite elegant in a rather vibrant key. On the palate it's medium bodied and bright, with lively tart berry fruit supported by warm rather splintery tannins that flow into a warm fruit laced finish. Pleasant, and though it's a touch too tart to be drunk by the glass, it will work quite well with grilled meats or light stews, and will go quickly. The back label says "appassimento breve," in other words the grapes were dried briefly before they were pressed. It's deep pigeon blood ruby with black reflections and cherry rim. The bouquet is fairly intense, with rich cherry laced with deft slightly greenish sandalwood spice and some hints of licorice root and sugar. Quite elegant in a slightly exotic key, and also quite young. On the palate it's full, and rich, with powerful greenish sandalwood laced berry fruit supported by deft acidity and clean rich smooth tannins. Very nice, and the palate confirms the youth of the nose; it will give much now but richly reward those who can give it 3-5 years. In short, a beautiful balance of fruit and acidity, with the acidity slightly to the fore, and this will make for a long life. I also tasted a barrel sample of the 2007. It's quite elegant, and brasher, with more acidity (even taking into account its greater youth), and seems a little more nervous. Promises very well, and should age well too. Lively black cherry ruby with black reflections and hints of almandine in the rim. The bouquet is rich, with warm red berry fruit laced with sandalwood and alcohol, with hints of licorice root and slight balsamic overtones. Very pleasant and one could sniff it at length; there's something sassy to it. On the palate it's full and rich with lively berry fruit supported by bright mineral and sour cherry acidity, and it all flows into a a clean bright sour berry fruit finish. Nice balance between fruit and acidity, with the acidity evident but not overwhelming, and though one could drink it now with succulent red meats it will richly reward those who can give it time. Worth seeking out if you're traditionally minded, and also if you're not. I also tasted a barrel sample of the 2007; it's not as dry, and is pleasant, with rich fruit, and I found it a bit more approachable than the 2006. But perhaps less interesting, and less long lived. The 2007 barrel sample is bright, with richer, more intense berry fruit and less acidity, and is also smoother and rounder. In other words, a bit more approachable, and less bright, though it does promise well. The difference isn't quite as evident as it is in the two vintages of San Rocco, but it is there. Deep pigeon blood ruby with black reflections. The bouquet is rich, with berry fruit alced with sandalwood and alcohol, and bright acidity well supported by greenish accents. It's very young, and coming together, and though it's at the start of a long journey, it is nice. On the palate it's full, rich, and young, with lively underbrush and berry fruit supported by zesty greenish tannins that display a considerable peppery burr and flow into a clean warm finish with peppery overtones. It's a toddler at nursery school, and though one could drink it, it won't begin to show its potential for a few more years, say about 2012. Impenetrable pigeon blood ruby. The bouquet is very, very young, and vegetal, with considerable red currant acidity and abundant red berry fruit. It's a toddler who's not happy about being disturbed, and wants to go back to play. But quite elegant in its youth, and promises well. On the palate it's rich, with powerful bright berry fruit supported by spicy acidity and tannins that display a lively burr and flow into a clean rich berry fruit finish. It displays great elegance, but is behind with respect to the basic Amarone, and though this is to be expected it also means that if you must drink a 2005 Tedeschi Amarone now, this isn't the one. It will be spectacular when it gets a ways into its journey but that will take a few years. Expect it to age for 10-15 and perhaps more. Impenetrable pyrope with violet rim. The bouquet is rich, with prune and forest berry fruit laced with vegetal accents, berry fruit jam, and clean fresh sweetness. Great depth, and a delight to sniff. On the palate it's rich, with deft date-prune fruit supported by deft sweetness and powerful, smooth soft tannins that have pleasant greenish overtones and flow into a smooth greenish sweet finish that continues at length. Graceful, and very pleasant to drink; the Romans made Recioto, and as we taste this one we understand while it still has its devotees today. For more information about Tedeschi, visit their site. Fattoria di Lucignano is a small estate in the Comune of San Casciano, but not the Chianti Classico part. Rather, it's located in the Chianti Colli Fiorentini production area, towards Montespertoli, on good ground, which is clayey with much stoniness to guarantee drainage. The varietals are for the most part traditional, with Sangiovese predominating, and lesser amounts of Colorino and Canaiolo, though Riccardo Galli, the estate's agronomist, notes that in the past 10 years small amounts of Merlot and Cabernet Sauvignon have been planted too. Fermentation is temperature controlled, in glass-lined cement vats, followed by prolonged macerations -- 10-15 days -- on the skins. The malolactic fermentation takes place at about Christmas time, and the wines are bottled in September; the cellar is old and cool, and Riccardo says that under these conditions cement vats are perfect for keeping the wines fresh. Deep garnet ruby with black reflections and cherry rim paling to white. The bouquet is rich, with deft sour cherry fruit supported by savory accents and some bright, sour berry fruit acidity coupled with dusky shade and slight vegetal accents. Pleasant, and nicely balanced in a traditional key. On the palate it's medium bodied, with rich cherry and forest berry fruit supported by sour cherry acidity with underlying savory notes, and smooth sweet tannins that flow into a clean fresh sour cherry finish with a warm tannic underpinning. A pleasant food wine that will work very well with grilled meats or light stews, and also has the acidity necessary to go with fried meats and vegetables. Expect the bottle to go quickly. I also tasted a barrel sample of the 2007: It's quite pleasant, and perhaps superior to the 2006. 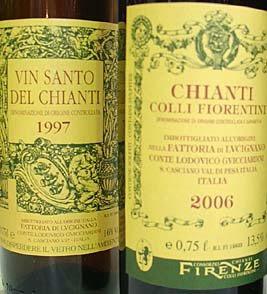 Fattoria Di Lucignano Vinsanto del Chianti 1997 Tawny amber with orange apricot highlights. Pleasant to look at. The bouquet is rich, with dried fruit -- dates laced with walnut skins -- and oatmeal, with some sticky dark brown sugar and deft hints of dried mushroom. Considerable depth and finesse. On the palate it's full, with rich dried apricot fruit supported by pleasant sweetness and apricot acidity that gradually fades into warmth, while walnut skin bitterness emerges to provide a counterpoint, and the finish is very, very long. A great pleasure to drink, and one of the nicest things about it is that it's not extreme -- sweet but not too sweet, and rich but not cloying. Perfect with friends by the fire after a meal, or even on a patio in the evening. Raboso is an autochthonous varietal grown in the valley of the Piave River, in the Veneto, and Nicolas Belfrage feels that the name derives from the Raboso River, one of the Piave's tributaries. He is less inclined to believe another possible derivation that has been suggested, a corruption of the word rabbioso, angry, though good Raboso is at the very least Ticked Off when young. Indeed, as Nicolas says, in "From Barolo to Valpolicella," the grapes are deeply colored, relatively low in sugars, and high in tannin and acidity, a mix that makes for inky wines that need time to get over having been made and become presentable. At least three years, according to the Disciplinare. The Azienda Agricola Tessère was founded in 1979 by Ilario Bincoletto, and is now run by his daughters, Emanuela and Loretta, who introduced modern viticultural techniques, including planting to high densities while reducing yield per vine -- concepts the other farmers in the area laughed at until they tasted the wines. Deep pigeon blood ruby with cherry rim; close to poured ink. The bouquet is fresh and bright with warm underbrush and vegetal accents mingled with hardwood ash and green leather, coupled with spice. Powerful and rich. On the palate it's full, with rich, powerful spicy berry fruit supported by clean fresh acidity and by splintery slightly green tannins that flow into a bright fairly greenish finish. Quite nice, though it needs another 2-3 years for the tannins to soften, and it will always be a food wine, something to drink with hearty red meats, including stewed game. It will be very nice in the proper setting, and will age for well over a decade. In a word, impressive, and if you like this more aggressive style it's something to seek out. This is an IGT because the appellation doesn't yet allow for the production of a Raboso Passito, though it soon will. Impenetrable pyrope -- poured ink. The bouquet is closed; determined swishing brings up deft red berry fruit supported by prune sweetness and tingling greenish accents; with time it opens beautifully and the fruit is joined by mace and nutmeg that work very well. On the palate it's full and rich, with powerful spicy cherry prune fruit supported by considerable dry tannic warmth that flows into a clean savory finish whose acidity leaves the palate very clean. Quite pleasant, and will drink very well with cheeses, or far from the table. Lively black cherry ruby with black reflections and white rim. The bouquet is bright, and brambly -- much livelier than Merlot often is -- with brambly greenness supported by teeth-squeaking acidity and warm sour cherry berry fruit. On the palate it's bright, with lively sour cherry fruit supported by brisk berry fruit acidity and fairly green peppery tannins that flow into a greenish tannic finish. It's scrappy, and a far cry from the smoother softer character one (I, at least) generally associate with Merlot; it has adapted well to the territory and is, well, a bit rabbioso. It will work well with flavorful fatty foods, for example grilled meats including sausages and ribs, and if you like the style you will like it very much. In short, three fine wines that are closely tied to the land, and display terrific character. I was impressed. Badia a Coltibuono, one of the historic estates of Chianti Classico, recently held a vintage presentation in Florence. I will be writing further about the estate shortly -- they will be presenting a Vertical at Vinitaly-- but wanted to give my impressions of the current vintage. Lively ruby with pale rim fading to white. The bouquet is bright and fresh, with lively berry fruit -- cherry and some red currant -- supported by bramble and spice, with hints of gum Arabic and underbrush, and fresh acidity; with swishing the gum Arabic fades to reveal jammy accents. Pleasant, and very, very young, but then again it is a 2007. On the palate it's fresh, with lively cherry fruit supported by moderate brambly acidity and brambly tannins that flow into a clean scrappy tannic finish. Quite deft, a food wine that will work well with simple grilled meats, light stews, and also has the acidity necessary to work well with fried meats and vegetables. Expect it to go quickly. Lively cherry ruby with cherry rim. The bouquet is fresh, with cherry fruit and some savory spice, and underlying underbrush and hints of sea salt. Nice balance, and with more swishing hints of dried porcini mushrooms and sundried tomatoes also emerge. Pleasant to sniff. On the palate it's medium bodied, and smooth, with fresh berry fruit supported by moderate acidity and dusky bitterness that flows into a clean bitter tannic finish. It's rounder than the 07, and this is not just grater age -- the 07 is scrappier and more aggressive. The 06 is quite easy to drink -- the Italian that comes to mind is beverino, which is quaffable -- and it will work well with simple grilled meats or light stews. A second bottle will come in handy. Lively cherry ruby with cherry rim. The bouquet is fresh, with fairly rich cherry fruit supported by berry fruit jam and some brandied cherries, as well as green spice from wood. Nice, though still displays the directness of youth, and is still developing. On the palate it's ample, with fresh cherry fruit supported by clean tannic spice and some sea salt, which leads into a clean fresh berry fruit finish. Pleasant, and though it needs another year or two to get its bearings, it will drink nicely with stews or roasts; it's one of those wines that probably won't stand out at a tasting, but that people will select it to drink with the meal that follows. Expect it to age nicely for up to a decade. Deep cherry ruby with cherry rim. The bouquet is fairly rich, with brandied cherry fruit supported by underbrush and some cedar, with underlying peppery spice. On the palate it's ample, and smooth, with moderately rich berry fruit supported by slight acidity, and by smooth sweet tannins that flow into a delicate cherry finish. Ruffiano (a street urchin) is the Italian word that comes to mind; it's quite approachable in a softer more international key, and if you like the style you may want to drink it by the glass. If you're more traditionally minded you'll prefer the Riserva. Tawny amber with apricot reflections. Delightful bouquet, with rich dried dates mingled with hints of figs, walnut rinds (in June, when they're green), sticky brown sugar, alcohol, and hints of oatmeal, supported by apricot acidity, while a fellow taster finds (correctly) cocoa powder.. In short, a great lot going on and an absolute delight to sniff. On the palate it's languorously full, with deft date and dried apricot fruit supported by dried apricot acidity and rich walnut skin bitterness that flow into a bitter walnut and dried fruit finish that lasts and lasts, with the sweetness gradually fading. Quite pleasant, and if you're not already a vinsanto fan it will convert you.